Complete Renovation! Beautiful & Eco-Friendly! 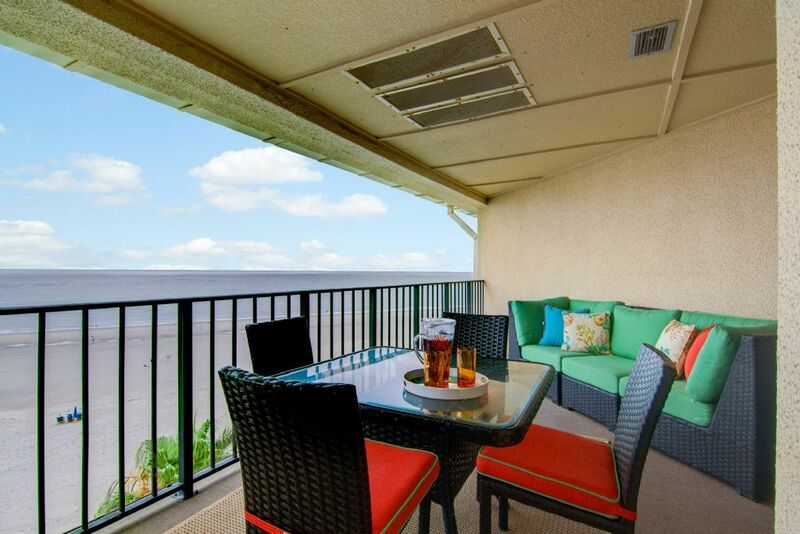 Top Floor Oceanfront 3BR/3BA Seascape Condo! $250 Beach Gear Credit! • The kitchen counter-tops are a mix of recycle glass and oyster shell designed by the artist at Fisher’s Recycling. It is simply amazing! • Every bathroom has been renovated using custom tile crafted by a Charleston Artist. • New mattresses throughout the home. Bedding includes two king beds, two full beds and a sleeper sofa. • All new duct work for HVAC system, special insulation, and premium ceiling material. • Smart HVAC system that is efficient and effective utilizing technology to turn on and off the system to prevent mildew issues. With so many wonderful renovations, the waves end where your dreams begin when you spend your next family vacation at 518 Seascape. Located in the exclusive resort community of Wild Dunes, 518 Seascape offers your family everything to make their stay comfortable and memorable. This wonderful condominium offers three bedrooms, each with a private bath. The paint colors, fabrics and art work have all been carefully coordinated to bring the beauty of Charleston’s coastline inside of this wonderful condominium. The master bedroom (featuring a king bed) and guest loft bedroom (featuring two full beds) each have amazing views of the Atlantic from the fifth (top) floor condominium. Each bedroom, including the second master bedroom which also features a king bed, is highlighted with new bed linens. The living area is spacious and features ocean views, large flat screen television, comfortable Pottery Barn queen sleeper sofa and gorgeous custom fabrics. The kitchen of Seascape is fully equipped with everything that your family will need to prepare a Low Country feast. When it is time to hit the beach you will find a pristine and quiet beach exclusive to the condominiums on the North-East side of the Island. Seascape guests and residents have the exclusive use of the Seascape swimming pool. Finally, Seascape is ideally located within a short walk of the highly ranked Fazio designed Wild Dunes Links Golf Course. Your dreams will begin where the waves end during your week vacation at the newly renovated 518 Seascape. This property features the Wild Dunes Club Sports Card. There are several facilities in the Resort community that are for the exclusive use of Club members. The Wild Dunes Sports Card grants access to vacation families to these facilities, which include the Club Swimming Pool, Tennis Club (court rental fees) and the Fitness Center (daily access fee). In addition, the Sports Card will grant access to the Palm Cove Pool and Boardwalk Inn Pool after 4pm. Listed rates may not reflect any current specials and/or discounts available. Please inquire for an exact and all inclusive quote. For payment, we accept V/MC/AMEX/DISC. Travel Insurance is available for an additional 7% of the total cost plus taxes. The condo is beautiful - great views of the beach! The kitchen has everything you could need. The seating in the living room is limited - if you have a rainy day/evening and want to watch a movie there is not enough comfortable seats. Also a few games, books, magazines and movies would be a great touch. We spent most of our time at the condo sitting on the deck which is perfect! The beach is extremely large - probably 400 yards to the water. The beach has many broken shells and there are piles of ocean reeds everywhere making it difficult to fine a "clean" space to set up near the water. Overall the condo was great and Wild Dunes is a beautiful destination! Loved, loved, loved the condo! It was beautiful, comfortable and incredibly clean! The only thing we were not prepared for was the walk to the beach. Apparently, a beach renovation was completed late in 2017 which made the walk incredibly long. It wasn’t bad for us but if you have little ones, it might be an issue. Wondering if a walkway could be built to make walking easier. Otherwise a wonderful vacation! Beautiful condo and we had a great vacation!! We loved our stay! Great access to the beach and not a crowded beach at all. The interior was nicely done and the beds were super comfortable. A few suggestions are the layout of the living room was not very cozy and there was no TV upstairs for the kids. Would have been nice to have some sort of sound barrier for the upstairs bedroom ( i.e. Curtain). Truly these are just picky items because overall it was an extremely beautiful condo. Relaxing. This unit well maintained. Beautiful property poolside with beach access. We had a wonderful stay. The location, size and convenience of this property is perfect! The pool with bar and restaurant access is a blast. Wild Dunes staff are very accommodating. The property itself was great with only a few upkeep needs. Mattress pads are needed on all beds. The upstairs master bedroom bedding needs addressed. The fitted sheets are too small and pop off as soon as you are in the bed. Deep pocket sheets are needed. The downstairs shower/ bath temperature is hard to adjust. It runs hot or cold not warm. But otherwise, the house was well appointed and had everything we needed. The coffee pot died while we were here and we had a brand new one before days end. The beach view is wonderful and soothes the soul. We loved our time here and will visit again. Thank you! Yacht Harbor Marina Watersports, Fort Sumter, Fort Moultrie, Charleston Market, Charleston Battery, Boone Hall Plantation, USS Yorktown, Ghost Tours, 6 Championship Golf Courses(within 15 minutes), BlackBeard's Amusement Park, Harbor and Dinner Cruises, Offshore/Inshore Fishing, Eco-Tours, and the Best Food on the East Coast!